This is a collection of mostly my dolls and memorabilia and photos sent to me of items belonging to others as marked. Again, please do not use my photos without permission or permission from the owners of the photos. Thanks. When the first stuffed Mr. Bingle dolls were made in the late 40's they were not dated. Therefore it is very hard to place them in any chronological order to an exact science. I do know that the earlier vintage dolls had mesh jute or burlap wings. I have seen vintage ones with cotton pom pom eyes and nose and some with silver metal eyes and red metal or plastic noses. I do not know which came first or if they were from the same era just different stores. One doll I have with the black cotton eyes came from the Lowensteins store in Memphis, Tenn., but that is not to say there were none in the New Orleans area. My thinking on this is perhaps cotton was a bit cheaper to use during tough economic times and that kept the cost down as opposed to using the metal, but that is my opinion. I know many of the earlier dolls had a characteristic tush tag with "Charactor" written on it. They also had red fuzzy hands and had what feels like and looks like wool in the body. The candy cane was made of twisted pipe cleaners, others I have seen were made with woven straw. No smile. The earlier dolls did not have smiles, just eyes and noses. Some were made in the way described but with no date or charactor tag. I date these between 1948-1958, approximately. As far as I know, next was the green felt wings, then the stuffed plump ones of today. If you were or are lucky enough to see one or own one of the vintage ones, more likely than not his hat is almost always slightly to greatly eaten up by moths. I don't know what it was about these hats but being stored in attics and basements and such, moths loved them! I would say if you have one with little to no holes in the hat, it would be more valuable; to me at least. At first he had no specific attire then over the years he gained new styles of sweaters and outfits from year to year and his hat changed to a more durable material. Some hats were sewed on straight and a few were put on sideways. I think the side ways hats are more rare. 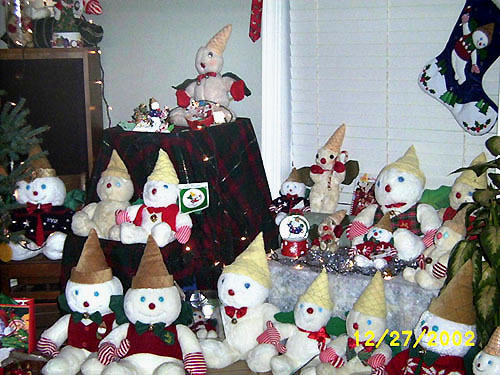 I've seen Mr. Bingle's made from all sorts of materials and some are more rare than others. The 1987 doll seems to be the most abundant, maybe it was because it was the 40th anniversary of Mr. B. Others are harder to find and memorabilia is the hardest especially hand puppets, pins, candy boxes and other items. There is a 45 record where I believe only about 300 were made at least here in the New orleans area, not sure about Memphis. They did do record recordings but that's all I know, right now. There are still many unanswered questions and mysteries and so much more to learn, but this is just a bit of my many years of research. Like I said I'm a collector. There's more but I cannot tell all my secrets. Below are some photos for your enjoyment and to help you place yours. Merry Christmas and May the Spirit of Mr. Bingle stay in your heart all year long! Oscar Isentrout once said: "You can't divide him, you can only multiply him, so there is plenty of Mr. Bingle for everyone." "Merry Christmas Everybody! ", Mr. Bingle would say.